Today I had the privilege of attending a storytelling workshop presented by NCTE and The Moth, at Penguin Random House Books in New York City. The Moth Radio Hour, produced by Jay Allison at Atlantic Public Media and presented by PRX, highlights personal narratives and storytelling of ordinary people. In addition to listening to the Moth Radio Hour, there is a Podcast and published collections of the stories told. Presenter and The Moth Storyteller, Micaela Blei shares five techniques of storytelling and what makes a story compelling? Change – Change is what separated a story from an anecdote. From the beginning to the end of the story, you’re somehow a different person, even if in a small way. Stakes – We like to define stakes as what you have to win or lose in the story. Or, alternatively, what MATTERED to you? Themes – Choosing a theme can help a storyteller decide how to shape this particular story. Deciding what thread or theme you want to draw out for this particular 5-minute version can help you make critical choices of details that pertain. Show Us vs. Tell – A story is most effective when you have at least one really vivid scene: with sensory details, action, dialogue, and inter thoughts/feelings. Be Honest/Be Real – There’s no one right way to tell a story. Be yourself. CCSS ELA Literacy.RL.11-12.5 – Analyze how an author’s choices concerning how to structure specific parts of a text (e.g., the choice of where to begin or end a story, the choice to provide a comedic or tragic resolution) contribute to its overall structure and meaning as well as its aesthetic impact. A time you did something you never thought you would do. A time your relationship with someone your love changed – a little or a lot. A time that you took a risk – or decided NOT to take the risk. A time you tried to be something your weren’t. I am in St. Louis, MI to attend NCTE (National Council of Teachers of English) and it is always empowering to be among thousands of English Teachers, Literacy Coaches, Researchers, and Authors. From 7:00 AM through the wee-hours of the night we are listening, learning, networking, collaborating, discussing, sharing, and inspiring each other. This annual convention is one of the best in-person professional development opportunities for someone in the English Language Arts and Literacy field. Yesterday the kickoff included a meet up for Middle School Teachers with Ignite Keynotes from Kylene Beers, Donalyn Miller, Penny Kittle, Chris Lehman, and author, Olugbemisola Rhuday-Perkovich addressing the role of Middle School and literacy in shaping student identity. This morning the power of poetry was the theme with Jimmy Santiago Baca and youth Poet Laureate, Amanda Gorman. The first session I attended was with Penny Kittle on “Creative Structures for Organizing Writing: Beyond the 5 Paragraph Essay.” She mentioned that the five paragraph essay is nothing that students have to complete in college so why are we using this limited writing structure to teach writing. Breaking free of the 5 Paragraph essay structure allows for more authentic writing like Op-Ed pieces, reviews, profiles and Public Service Announcements. Show students the models and mentors to help them succeed in writing these types of texts and build their writing repertoire. Her handouts are available on her website under NCTE. Kelly Gallagher spoke about Fake News and helping our students develop world knowledge and being critical readers. Too many people accept information for what it is where a website, news story, or text and don’t ask questions about who is writing the story? What is their purpose? What is being left out? Who is the audience? Does it pass the CRAP Test – Currency, Reliability, Authority, Purpose? He argued that maybe we need to put literary analysis aside in order to bring to the forefront the value of the reading experience. I was one of the presenter in the next session on Igniting Wonder in the Classroom along with Laura Robb, Kristen Ziemke, Carol Varsalona, Blanca Duarte, Laura Purdie Salas, and Wonderopolis. I presented on Quest Based Learning to spark wonder and play in the classroom. My slide deck is below. Dropping into the exhibit hall, a few ARC copies of soon to be released books were shared and cannot wait to start reading. New titles that tackle historical fiction and zombies, dystopia, and poetry. Classrooms of the digital age are interactive spaces where literate lives are groomed through the analysis and synthesis of content. Perspectives formed during collaborative conversations give rise to innovative ideas but not every teacher is ready to be part of the digital change. How can classroom environments become havens of active learning and schools encourage students to make wise technology choices to become independent learners with authentic voices? As part of a round table session at National Council of Teachers of English Annual Conference, I presented gamification ideas and strategies for engaged, active, student-centered classrooms where choice leads to increased voice. Here are a few of the games and activities referenced in the slides that I have created for my students that correlate with units of study. Here is how this activity works, using a set of dice [or have task cards Think DOTs that have assignments on one side and colored dots that match a “dice” roll on the other side], students can “roll the dice” to see which activity or question they have to complete. You can use different cubes for different students depending on their readiness, interests and learning profiles. The example that I provided below is a for reading response questions for To Kill Mockingbird. There are two sets that are differentiated based on students level of understanding. Last week I spent four days at the National Council of Teachers of English Annual Convention in Boston. The convention was inspiring, informative, and a great opportunity to address current trends in English Language Arts today. 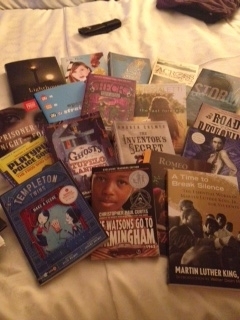 Throughout the convention I heard from resourceful teachers and engaging authors, brought back multiple bags of books for my classroom and professional development, and reflected on my teaching. Below are the top trends I took away from the conference and ideas worth sharing. Students do not have to read closely all the texts that we give them, but depending on task and the passage, students need to be able to read critically and closely to comprehend, analyze, and discuss text. Part of the Common Core, close reading requires students to slow down their reading and be able to make inferences and synthesize their understanding of the text. There are so many valuable professional resources that address this topic: Teaching Students to Read Like Detectives by Fisher, Frey, and Lapp, Note and Notice by Beers & Probst, and also Lehman and Robert’s Falling In Love with Close Reading. The Common Core requires that on the secondary level young people read 70% informational text. That does not mean throw out the literature you are teaching, rather, supplement great informational texts that connect with what you’ve been doing in class or because the texts are topically interesting. There are great resources available on the web to help teachers find relevant informational texts. The New York Times Learning Network is one resource to check out, especially their new “Text to Text” feature that pairs timely informational text with novels currently being taught in schools. For example, Romeo and Juliet’s Montagues and Capulets as Shiite and Sunni is an interesting perspective to use as a lens for reading this classic conflict ridden love story. Another new book soon to be released spring 2014, Using Informational Text by Audrey Fisch and Susan Chenelle offer nine informational articles to pair with To Kill a Mockingbird. The text includes the informational articles from a thematic perspective and scaffolds the reading of the text to support students’ reading and thinking. Sample chapters include speeches, interviews, newspaper articles, and medical documents. Sample texts are available on their website. The hottest trend in publishing for young adults is dystopian fiction. With the success of The Hunger Games, there is a plethora of new novels, as well as renewed interest in older ones. I attended a session on dystopian literature and social theory (Derrida, Foucault, and critical race theories) in the English classroom. The presenters addressed how social theory offers an opportunity for students to think critically about the realistic and futuristic worlds presented in the fiction. The dystopian novels presented in the session included Brave New World by Aldous Huxley to address issues of power, Chaos Walking series to address language, and Octavia Bultler’s Parable of the Sower to address race and ethnicity. As a 8th grade teacher who will be using dystopian novels for a literature circle unit this winter, this session gave me possible book titles and an idea to help my students critically engage with the text. Neil Schusterman, author of the dystopian series Unwind and UnWholly, was a key note speaker for middle school teachers. He spoke about where all the ideas for his recent book series emerged from, like pieces of a jigsaw puzzle that fit together to create a larger picture. I was mesmerized by the different stories in the news that Schusterman pieced together to create a gripping tale about a world that is pro life, but between the ages of 13 and 18 parents may choose to retroactively get rid of their child through a process called “unwinding” and transplanting their organs into various other recipients. I cannot wait to read this book. There were teachers and workshops who embraced the Common Core and a few that were in opposition to the CCLS. The bottom line is that the Common Core is here now and teachers must effectively address the standards to help their students succeed. All of the workshops made connections to the Common Core addressing reading, writing, literacy, vocabulary, and assessment. I do not think that teachers need to reinvent what they are doing in their classroom right now, we need to pay particular attention to what we are doing right and include classroom experiences that teach skills necessary for reading complex texts and tasks that require higher order thinking. Whether we are talking about gaming or QR codes, technology is an amazing tools to support our students as readers, writers, and creators. 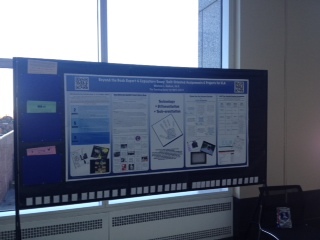 I presented a poster that included more than three dozen technology based projects that I have had my students complete. Projects like creating movies, wikis, blogs, glogs, and more. It is not about the technology, but the skills that students are utilizing when accessing technology. Technology just adds a more contemporary and digital component to the assignment.